Psychopath. No sooner is the word out than images of murderers, rapists, suicide bombers and gangsters flash across our minds. But unlike their box-office counterparts, not all psychopaths are violent, or even criminal. Far from it. In fact, they have a lot of good things going for them. Psychopaths are fearless, confident, charismatic, ruthless and focused - qualities tailor-made for success in twenty-first century society. In this groundbreaking adventure into the world of psychopaths, renowned psychologist Kevin Dutton reveals that there is a 'scale of madness' along which we all sit. Incorporating the latest advances in brain scanning and neuroscience, he shows that there is a fine line separating a brilliant surgeon and a serial killer, illustrating the spectrum of psychopathy with some insightful and startling case studies. 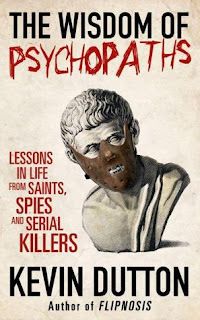 The Wisdom of Psychopaths is an intellectual rollercoaster ride that combines original scientific research with bold on-the-ground reporting from secret monasteries, Special Forces training camps and rarefied psychopath wings of maximum-security hospitals. Provocative, engaging and surprising at every turn, The Wisdom of Psychopaths reveals a shocking truth: beneath the hype and the popular characterisation, psychopaths have something to teach us. And don't forget to head on over to the author's website and take the Psychopath Challenge! It was the title, and the somewhat scary cover, which first caught my attention. What promised to be a leap into the world of Hannibal Lecter is actually much more than that. 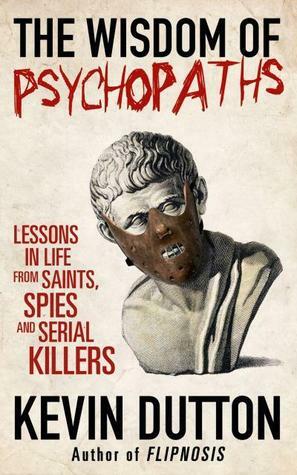 In The Wisdom of Psychopaths psychologist Kevin Dutton introduces the reader to what exactly psychopaths are made of and, surprisingly, they have got quite a few good things going for them as this insightful and wonderfully entertaining tract proves. Connecting psychopaths to violent behavior, to associate them with vicious crimes, is easy, and some will doubtlessly live up to this expectation. Still, your doctor may be one too, but that's not necessarily a bad thing. The point is that there is a fine line that separates a great surgeon from a serial killer. This book isn't so much about what psychopathic character traits we could adopt to implement them in our own lives, after all how do you learn to be charismatic or fearless, but it beautifully depicts why psychopaths are the way they are on both a neurological and psychological level. Ultimately it's about understanding them and Dutton does an amazing job illustrating their inner workings. I don't think I have ever read a book that so skilfully blends a serious topic with an adventurous streak, especially when he undergoes a "psychopath make-over". Fast-paced, fun and smart, this is for everyone who wants to know more about what makes psychopaths tick! In short: An intriguing and captivating work about the psychopath's mind!